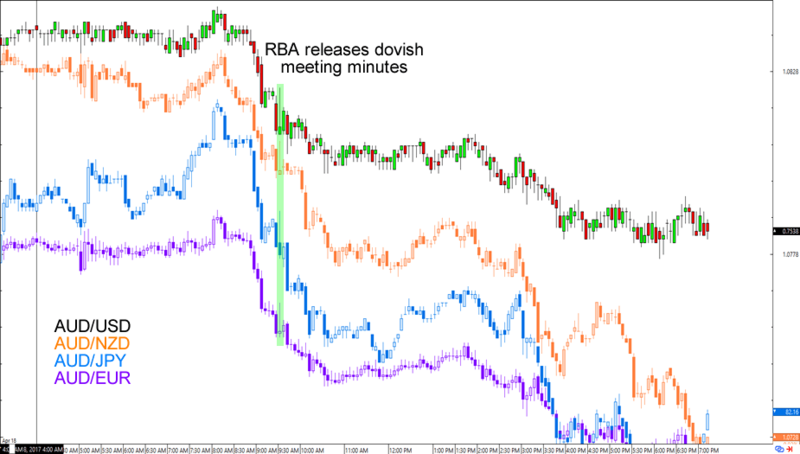 With not a lot of data scheduled for release today, forex traders turned their attention to the RBA’s April meeting minutes. If you recall, the central bank kept its interest rates at 1.50%, saying that it’s still consistent with achieving sustainable growth and the RBA’s inflation target over time. Philip Lowe and his team are happy enough with the global economy as conditions have “continued to improve over 2017” with the pick-up seen across both developed and emerging economies. Various policies, financial and geopolitical risks “still need to be closely watched,” however. Global inflation has also increased since oil started to rise in 2016, though core inflation remained low. The RBA still expects higher inflation though, especially if economies further reduce spare capacity even as the effects of higher oil prices wind down. One of the biggest tidbits in the RBA’s minutes is its admission that “conditions in the labour market had been somewhat weaker than had been expected.” Apparently, the RBA is concerned that ongoing spare capacity is contributing to low wage growth (and therefore low consumption) outcomes. The central bank mentioned February’s jobs numbers, which reflected a higher unemployment rate and a net job loss. It’s important to note, however, that RBA members met BEFORE March’s jobs numbers were released. The latest figures reflect a stronger picture with job increases concentrated on full-time jobs, generally mopping up some of the spare capacity that the RBA was worried about. Still, RBA members were gloomy enough during the meeting that they’ve shrugged off forward-looking indicators hinting of steady employment growth over the coming months. According to them, “these forward-looking indicators had been suggesting more positive employment outcomes than had been realised for some time.” Talk about managing expectations! As expected, household consumption was affected by subdued labour market conditions. The RBA noted that “indicators of household consumption had been a little weaker than expected in early 2017” with retail prices also further restrained by competition. Meanwhile, households’ perceptions of their personal finances have also fallen to “below-average” levels. Yikes! In its policy statement, the RBA all but high-fived regulators such as the Australian Prudential Regulation Authority (APRA) for placing more restrictions on housing loans that are blowing up house prices and endangering household borrowers who can’t pay the principal on their loans. Loans to owner-occupiers had moderated but loans to investors had “increased steadily” despite tightened lending standards. Margins between lending rates on (principal + interest) and interest-only loans had increased more for owner-occupiers than for investors. Funding costs had not changed significantly despite measures introduced by APRA in 2014 and in late March. Borrowing for the household sector is growing faster than income growth. Debt-to-income ratios for households have increased. At the end of the day, RBA members believe that it would take time to “fully assess” the impact of new lending measures and pricing changes. The central bank estimates that GDP had expanded “at a moderate rate” in Q1 2017 with Cyclone Debbie in Queensland and the floods in northern New South Wales likely to have limited impact on coal consumer prices and domestic growth. The decline in iron ore prices is expected to pull down Australia’s terms of trade from its recent highs, but increases in commodity prices in general are expected to boost the economy in Q1 2017. Risks for non-financial sectors also remain low with resource-related firms enjoying the increase in commodity prices, while banks are “well-placed” to manage challenges especially when APRA finalizes its new standards. If you haven’t noticed yet, the RBA seems most worried about the slack in the labour market as well as increased risks from housing credit. For many market players, this means that the RBA’s next move is more likely a rate cut than a hike, with its schedule determined by how bad (or good) the next labour and housing market numbers are. This is probably why the Aussie took hits against its major counterparts for most of the Asian trading session. What do you think? Will we see another rate cut from Lowe and his team this year?